The traditional old recipes remain alive in succulent dishes such as caldo azedo (a kind of soup), couves solteiras (prepared with cabbages). fervedouros, polvo guisado em vinho de cheiro (octopus stewed in local wine), torresmos em molho de figado (rashers of bacon with liver sauce), caldeiradas de peixe (fish stews), arroz de lapas (limpets with rice), ensopado de trutas (trout stew) and lapas de molho Afonso (limpets with a tasty sauce). To these must be added the curious cozido prepared at Furnas, where the pot containing meat and vegetables is buried in the soil wrapped in a cloth bag so that the volcanic heat can do its work... and several hours later it is ready to delight the palate with its flavour. Lobster, cavaco, crabs and the strange goose barnacles, hidden in the holes they carve in the rocks, satisfy the needs of shellfish lovers. As regards cheese, São Miguel can offer a smooth white fresh variety made from goat's milk and the famous queijo da ilha, made from cow's milk and with a piquant flavour when dry. The old conventual recipes for desserts are the delight of people with a sweet-tooth. Examples are the queijadas (cheese-cakes) of Vila Franca do Campo, the concertos of Ribeira Grande, the bolo levedo of Furnas as well as the barriga-de-freira, massa sovada, bichos de amendoa and compota de capucho (a jam made from the small fruit of a herbaceous plant). The Caloura region produces a wine called vinho de cheiro or morangueiro, which is light and has a characteristic flavour. The liqueurs made from passion-fruit and pineapples are agreeable ways of concluding a meal. Pineapples, tea... and tobacco. 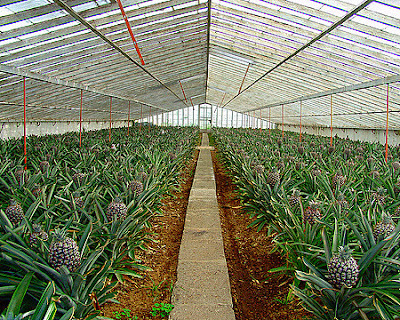 One of the curious things about São Miguel is the hot-houses for pineapples, which produce flavoursome, sweet fruits all year round for markets in many European countries. The main concentrations of hot-houses are situated in the areas of Faja de Cima, Lagoa and Vila Franca do Campo. Tea, that delicious beverage brought from China, is also produced on plantations that attract attention because of the unusual and charming sight of the green tea bushes covering hills and dales, divided into fields by hedges of araucarias and Japanese cedars. Tea growing got under way in the late l9th century and in 1878 two Chinese came to São Miguel to teach the islanders the complex tasks involved in its preparation. The main plantations are located at Gorreana, next to the old Chapel of Senhora do Resgate. Another plant that finds optimum conditions for its development in the sub-tropical climate of the Azores is tobacco, which is grown almost everywhere in the land and is manufactured locally.